The effects of the Great Depression dramatically reduced the amount of money available for new attractions. To make matters worse, in April of 1932, workmen retarring a roof started a massive blaze that destroyed the Bug House funhouse, and heavily damaged the Derby coaster. The Derby was subsequently torn down, and the Bug House was replaced with a new funhouse, Aladdin's Castle. Riverview had wanted to purchase a Flying Turns ride new from the manufacturer since its introduction, but was unable to come up with the funds to buy one. They were forced to purchase one used from the 1933-34 Chicago Worlds Fair after it closed. Riverview closed its large Kiddie Land, demolished the Kiddie Bobs coaster along with it, and moved the Flying Turns to the site. The photo shown here is an aerial view of the Flying Turns on the World's Fair midway. In 1936, Riverview converted an old observation tower, the Eye-Full Tower (a corny pun), into a new ride, the Pair-O-Chutes. The Pair-O-Chutes was based on a parachute training tower invented for the military by Maj. James Strong. Riverview's was the first civilian tower in the US. Riverview's tower was copied by the 1939 World's Fair for their amusement zone, and that ride was later moved to Steeplechase Park on Coney Island. 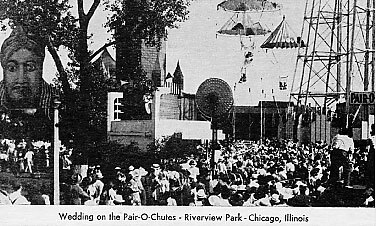 In 1939, a couple got married on the Pair-O-Chutes. For more details, see the book version of Laugh Your Troubles Away - the Complete History of Riverview Park. Also during this time period, Riverview renamed the Big Dipper coaster to the Zephyr in 1936, and to the Comet in 1940. The Pippin coaster was renamed the Silver Flash in 1938, and the Skyrocket was renamed the Blue Streak in 1936. With the coming of World War II, money and materials for new attractions dried up, but because people were unable to travel much due to wartime gas rationing, people did continue to attend the park in large numbers. During the war years Riverview only added a few carnival type rides, most of which had been purchased used. After the war ended, people suddenly got the travel bug and Riverview's attendance plunged sharply. Consequently, few attractions were able to be added until the 1950s.